With fuel prices on the rise, more drivers are switching to electric cars. 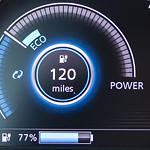 The Nissan LEAF is a popular electric vehicle that comes fully loaded with all the latest tech features. The Nissan LEAF will change the way you drive forever. The LEAF features one pedal driving. With E-Pedal, you press the pedal to speed up and ease your foot off the pedal when you want to slow down. Don't panic. The Nissan LEAF comes with a brake pedal that you can use at any time. The people at Nissan are simply experimenting with ways to simplify driving. The Nissan LEAF also has automatic braking to help keep you and your most precious cargo safe. If there's a hazard in your path, the Nissan LEAF will apply the brakes for you. The LEAF also utilizes sensors and cameras to detect pedestrians crossing the road.